Last December, 28-year-old Andrew Finch of Wichita, Kansas was shot and killed by police responding to false reports of a hostage situation at a local home. Tyler Barriss, of Los Angeles, was arrested by Kansas state authorities for allegedly making the prank call which led to Finch’s death. Now, two additional men have been charged in the incident. Those charges all present significant punishments. The harshest, for making false reports to emergency services or cyberstalking which results in someone’s death, present a maximum penalty of life in federal prison and a fine of $250,000. Swatting has been an unfornately common practice – just recently, 12-year-old Fortnite player was swatted – but this is believed to be the first death related to the practice. Prosecutors allege that this swatting prank stems from an argument between Viner and Gaskill during a Call of Duty match. “Viner later asked Barriss to ‘swat’ Gaskill at an address provided by Gaskill. Viner did not know that the address Gaskill provided … was an old address where Gaskill no longer lived, but Gaskill did and Gaskill also kept giving the old address to Barriss.” Members of the Call of Duty community provided a similar story of these events at the time of the original incident. The LA Times report that Barriss had already been under investigation for numerous other false calls to law enforcement, including two dozen fake bomb threats leading to evacuations of television stations and an elementary school in the Los Angeles area. Barriss went to jail in May 2016 after pleading no contest to charges of making a false bomb threat. He was released on January 20 2017, but was arrested a day later in the San Fernando Valley and spent another seven months incarcerated. Barriss also faces criminal charges in Calgary, Alberta, Canada for another swatting call, which the Globe and Mail report involved a woman targeted for her “online persona.” No one was hurt in this incident, but Barriss faces mischief and fraud charges. 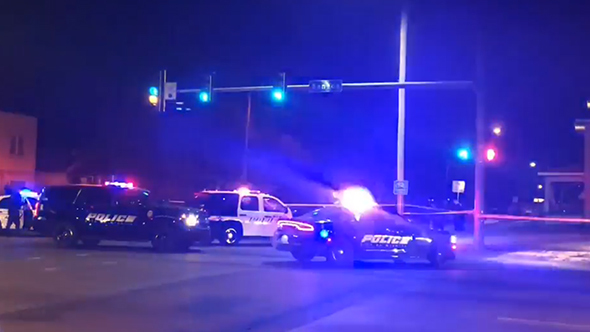 Wichita police released both the 911 call that led to the incident and body camera footage of the shooting several months ago. Victim Andrew Finch was unarmed, but police say he reached toward his waistline multiple times despite commands to keep his hands raised. Two months ago, Kansas lawmakers introduced the Andrew T. Finch bill – or HB 2581 – which increases state penalties for false emergency reports leading to injury or death. Lisa Finch, the mother of the victim, told local news outlet KSN that she’s “very happy that it’s named after my son. If it prevents even one tragedy like this happening to another family, that will be amazing.” The bill was signed into law on April 26.